Ascent Group Singapore brings to you Zumba Bali 2017, a one-of-a-kind gymboree featuring Singapore's key instructor Abdul Ghani Bin Ismail, aka Ghani Kibbles! 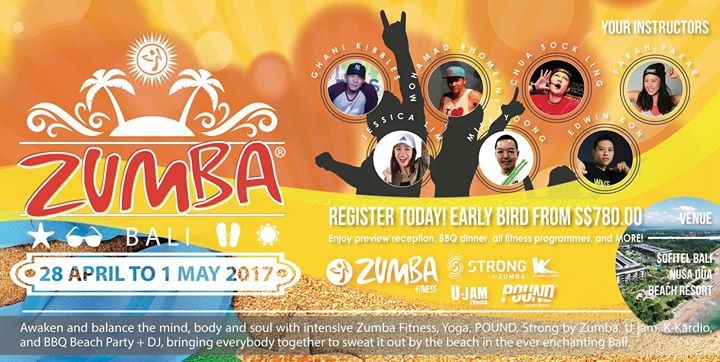 Awaken and balance the mind, body and soul with intensive Zumba Fitness, POUND, Strong by Zumba, U-jam, K-Kardio, Yoga, and BBQ Beach Party + DJ, bringing everybody together to sweat it out by the beach in the ever enchanting Bali. Jam along with renowned instructors including Mohamad Rhomeiny, Chua Sock Ling, Jessica Lim, Edwin Koh, Mike Yoong and Farah Fakar in an intensively fun and exhilarating retreat by the sun, sand and sea. Also available: PROGRAMME ONLY fee of S0! Registration includes hotel booking, breakfast, preview reception, BBQ dinner, all fitness programmes and MORE!